Did it happen, or didn't it? That is the question. What we do know about the Mayweather vs. Pacquiao debacle is that it’s not going to happen, according to Bob Arum, Pacquiao’s promoter. The answer is Antonio Margarito, says Arum, head of Top Rank, about Pacquiao’s Nov. 13 fight. This is where the true problem lies within boxing. We need fighters like Floyd Mayweather and Manny Pacquiao, but do we really need power-hungry businessmen with agendas? Arum’s agenda is to make as much money as possible, no matter what it does to boxing as a whole -- even if it leaves true boxing fans in the dust. To make boxing great again, we can’t have promoters like Arum who have suddenly become out of touch with boxing. We need promoters who are willing to pit the best boxers against each other, without regard to which fighter is under contract to which promoter. Major promoters such as Oscar De La Hoya’s Golden Boy promotions and Arum’s Top Rank need to stop picking and choosing their opponents and fight the best, no matter who the fighter’s promoter is or how much money the promoter can steal from true boxing fans. If you want to further damage the sport of boxing, keep matching Pacquiao against guys like Margarito and Joshua Clottey. Clottey was coming off a loss to Miguel Cotto, who is a very credible fighter -- but how does losing your last fight earn you the right to face the world’s pound-for-pound No. 1, Pacquiao? Then you have Margarito, who is coming off his year-long suspension for attempting to load his gloves prior to his fight with Shane Mosley -- a bout in which Margarito ultimately was demolished. Then, unimpressively, he beat Roberto Garcia -- and now he is scheduled to fight Pacquiao. I guess guys like Amir Khan, Tim Bradley, Andre Berto, Devon Alexander and Paul Williams wren't suitable opponents for Manny. If you want to go one step farther, Pacquiao’s next fight is for the light middleweight title, but at a catchweight of 150 pounds. Why not fight a light middleweight such as Sergio Martinez, who just won the middleweight crown after moving up in weight just to get a big fight and a big payday? 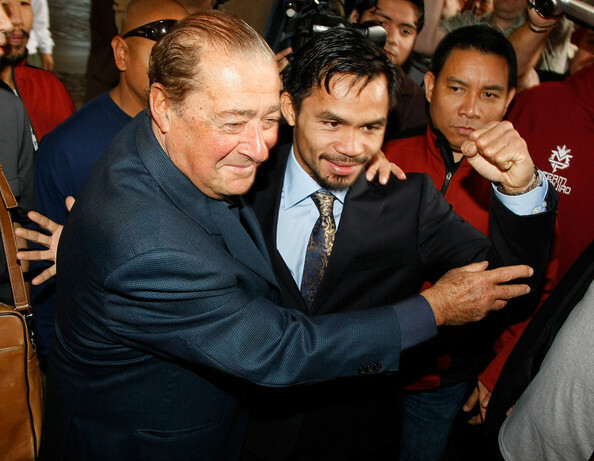 Arum is the promoter of both Margarito and Pacquiao. and whatever money is made from the fight it stays in-house, so to speak. This is great for Top Rank and Arum, of course, but is this great for boxing? The obvious answer is a resounding no. Boxing fans are bitter, and frankly they should be. Where would boxing be with out legendary fights like Ali-Frazier, Ali-Foreman, Leonard-Hagler, Leonard-Hearns and Vasquez-Marquez I, II and III? No one man or promoter is bigger than boxing. If it weren’t for the aforementioned fighters, Pacquiao and Mayweather wouldn’t have a chance at such megafights because boxing would have faded away long ago.